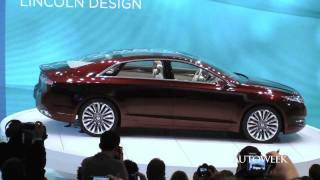 Lincoln MKZ Concept 2012 had its cover taken off at the Detroit Auto Show 2012. 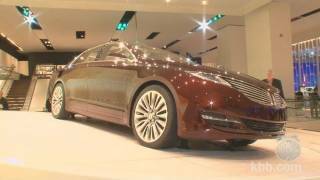 The MKZ Concept signals Lincoln's vision of its next-generation vehicles. Warm hues are evident in every aspect of the new vehicle’s Cognac-colored exterior. The deep finish is achieved with a rich base coat covered in multiple layers of tinted clear-coat finishes. The Lincoln MKZ Concept four-seat interior is open, warm and inviting. The sedan is capable of utilizing multiple powertrain options in front-wheel-drive and all-wheel-drive configurations. 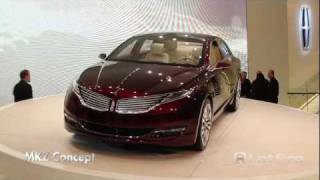 DETROIT, Jan. 10, 2012 – The new Lincoln MKZ Concept, revealed today at the North American International Auto Show, signals a significant step in Lincoln’s reinvention, providing a clear vision of its next-generation vehicles. 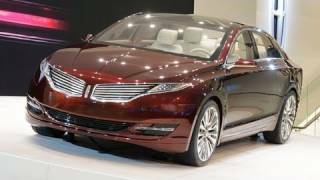 The MKZ Concept strongly hints at the production model arriving in dealerships later this year, as well as Lincoln’s design future. Warm hues are evident in every aspect of the new vehicle’s Cognac-colored exterior. The deep finish is achieved with a rich base coat covered in multiple layers of tinted clear-coat finishes. By retaining key, recognizable brand design elements, the MKZ Concept remains clearly identifiable as a Lincoln. One example is the more refined interpretation of the split-wing grille, introduced on the 1938 Lincoln-Zephyr. The sedan’s profile is dominated by a long, sleek and sweeping roofline that allows the design to break away from the traditional sedan three-box shape. The lengthening of the roofline enables a more flowing, elegant and more naturally aerodynamic appearance. A panoramic glass roof spans uninterrupted from the windshield to the top of the backlight. Integrated into the sedan’s aluminum and boron steel superstructure, the fixed-glass expanse extends to the side roof rails of the cabin, creating an airy, open interior. LED technology enabled an extremely thin and distinctive full-width taillamp graphic. Exhaust tips are cleanly integrated into the rear fascia. The Lincoln MKZ Concept’s four-seat interior is open, warm and inviting. “The front graphic is repeated in the dramatic sweep of the instrument panel, helping tie the interior to the exterior. These flowing forms create a comfortable and functional interior that particularly appeals to the younger, more diverse customers we are targeting,” said Wolff. Innovative interior features include push-button transmission gear selection, an open, tiered center console and liquid crystal instrumentation. The reconfigurable 10.1-inch Thin Film Transistor (TFT) LCD positioned ahead of the driver operates with the latest version of MyLincoln Touch™ as does the nearly flush-mounted center 8-inch LCD touch screen. Responsibly harvested poplar wood, aluminum in bright and satin finishes as well as leather help create a sculptural, luxurious and comfortable interior space. Champagne-colored leather seats with dark taupe accents feature a champagne perforation pattern, so-called because the perforations on the seat backs conjure the image of champagne bubbles rising from the bottom of a glass. 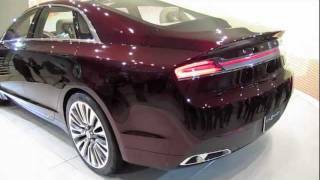 The Lincoln MKZ Concept is a styling study that rides on an all-new midsize platform. The sedan is capable of utilizing multiple powertrain options in front-wheel-drive and all-wheel-drive configurations. Like the recently introduced MKS and MKT with EcoBoost™, the Lincoln MKZ Concept features Lincoln Drive Control and the sophisticated Continuously Controlled Damping (CCD) adjustable suspension. During the past 14 months, Lincoln has built a dedicated team – including designers, engineers, quality and manufacturing experts as well as marketing and sales leaders. The team includes people from luxury brands, some outside of automotive. Many of the new team members begin working this year in the all-new Lincoln Design Studio in Dearborn, Mich. Under Wolff’s direction, construction of the 40,000-square-foot studio began in early 2011 and ultimately will house more than 180 modelers, engineers, stylists and designers in a space that encourages creativity and collaboration.